The best thing that's happened for underground coal miners in the past several years can be found in a small provision of the Affordable Care Act, otherwise known as 'Obamacare.' It is never mentioned by the President or his campaign. President Barack Obama will likely lose badly to Mitt Romney in the coal-producing counties of Appalachia. John McCain wiped out the Democrats in Appalachian counties in 2008, and since then Republicans have charged that President Obama has waged a “war on coal” by tightening regulations in ways that disadvantage coal, coal miners and coal communities. President Obama hasn’t done much to counter the charges. He came to West Virginia in the aftermath of the Upper Big Branch coal mine disaster, but we can’t recall another visit to the eastern coalfields during the last four years, much less during this campaign. 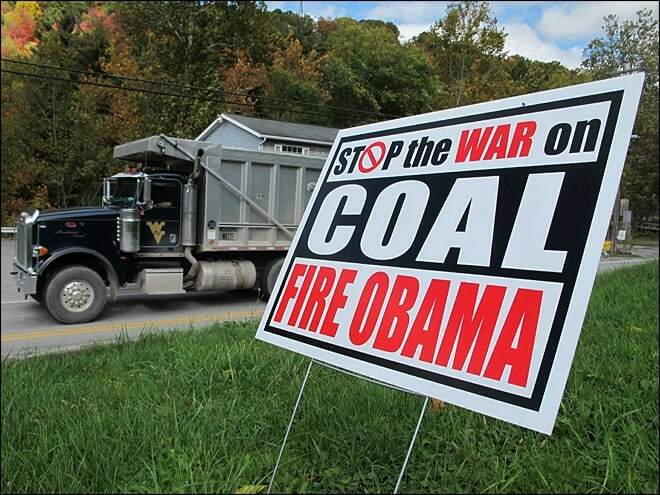 Meanwhile, there have been “war on coal” rallies across the coalfields. Vicki Smith, an AP writer, who has written a wonderful story on the “war on coal,” tells us that now more than 55,000 people in Kentucky have bought special “Friends of Coal” license plates. President Obama has conceded the vote in Appalachia without putting up a fight. The thing is, he’s not without ammunition in this war. Ken Ward Jr. of the Charleston Gazette asked several people what the president should be talking about in coal country in a column titled “What Could President Obama Say About Coal?” He had plenty of advice. The most important law passed during the last four years for coal miners, however, may be one of the most unpopular in rural West Virginia, Virginia and Kentucky. It’s the Affordable Care Act (aka, Obamacare) and within that law are benefits coal miners have been seeking for the past 30 years. Before he died in 2010, Sen. Robert Byrd of West Virginia amended the Affordable Care Act to benefit coal miners. He inserted a provision saying that if a person had worked as an underground coal miner for at least 15 years and suffered from the effects of pneumoconiosis (black lung), the presumption would be that coal dust caused the ailment. And the coal miner would be entitled to benefits. Previously, coal miners had to prove that their lung problems were caused by coal dust. X-rays would be taken of ailing lungs and doctors would try to discern if coal dust were the cause. Because coal companies would appeal judgments and it is hard to tell from an x-ray if damage has been done by smoking or coal dust, very few miners who applied for black lung benefits over the years received them. Very few. Only about 15 percent of the miners who applied for benefits received them before the Affordable Care Act was passed. Coal miners have been battling black lung for more than two generations. After marches and protests throughout the coalfields in 1968, Congress passed a law in 1969 that was supposed to put a stop to the disease. It also paid compensation to miners afflicted by black lung. In the early 1980s, Congress ended the presumption that miners who worked underground and showed signs of black lung were sick due to coal dust. The reasoning was that new coal dust regulations had effectively ended black lung and that anyone who showed symptoms was suffering from something other than the effects of coal dust. Nothing could have been further from the truth. Since 1969, 70,000 coal miners have died from black lung. Ten thousand have died in the last ten years. Over 55,000 cars in Kentucky bear this license place. Black lung is back. When autopsies were done on the 29 coal miners who died in the 2010 Upper Big Branch Mine Disaster (UBB) in Montcoal, West Virginia, 24 of the men were found to have black lung. Moreover, investigations by National Public Radio and the Charleston Gazette found widespread cheating by mining companies on dust samples used to determine if coal mines are safe. And reporters found that federal officials had done little over the past quarter century to address the black lung problem, even as more miners died from the disease. Two years ago, the federal Mine Safety and Health Administration proposed new rules that would crack down on cheating and reduce the levels of coal dust allowed in underground coal mines. Some of these changes were first recommended in 1996. The regulations had been blocked by Congress, but even after that obstruction had been removed, Ward reported, the Obama administration has been slow to act — on rules that were first recommended 16 years ago. The real benefits coal miners have received have come from the Affordable Care Act (“Obamacare”). More than 700 disabled coal miners or their surviving spouses are already receiving benefits under this new provision, according to Timothy MacDonnell, director of the Black Lung Clinic at Washington and Lee University School of Law. Sen. Byrd died in 2010, just a few months after the Affordable Care Act was signed into law by President Obama. He lived long enough to see his black lung provision enacted. United States President Barack Obama, Vice President Joe Biden, former President Bill Clinton, West Virginia Governor Joe Manchin and members of Congress attended the memorial service for Byrd at the State Capitol in Charleston, WV, on July 2, 2010. Byrd was 91 at the time and was revered in his home state of West Virginia. The speech was largely ignored. Byrd was right, and continues to be right — both about the needs of those with black lung and the future of the coal industry. But his speech and his black lung provisions in “Obamacare” continue to be ignored. According to one writer for Foreign Policy magazine, the outcome of this election “could come down to one thing: coal.” That doesn’t mean coal miners, however. Although both President Obama and Mitt Romney have pledged their support for coal, the issue of black lung — either its causes or compensation for those who contract the disease — has not arisen in this campaign. Bill Bishop is co-editor of The Daily Yonder.